The San Clemente Ladies 9-Tees Golf Club, created in 1958, is a friendly, fun-loving group of welcoming women of all ages. Becky Farrow, the current vice president, reports that the present membership average age is 50s. “Some of our ladies play well into their 90s,” she added. The 9-Tees are so named because they play competitively for just the first nine holes. Many play the back nine in a more relaxed mode. Some ride while others just walk, enjoying the camaraderie. Those with jobs, children, or other responsibilities can still play with the group on a regular basis, leaving after nine holes, a win for all concerned. Joanne Hodder is the current president of the San Clemente Ladies 9-Tees Golf Club - about 50 members strong with additional associate members playing occasionally and joining the social functions. They also meet on Tuesday mornings, teeing off after the SCWGC (nicknamed the 18ers). Starting time is 8:45 to 9am – depending on how many groups the 18ers have. Friendship between the two groups is another plus. Several tournaments and outings are held annually. A memorial is held every May, raising money for a member of the San Clemente High School girls’ golf team. This year $300 was awarded to Susan Meyers. Her plaque and photo are on display in the club house trophy case. In September the two week Club Champion tournament will be held. Nan Quinn is the current honoree. Past champions include Carol Tiberi, Sue Ariey, Sally Price and Karen Perkins. Other tournaments include a Spring and Fall Scramble, with luncheon following the game. Their Christmas luncheon is held on a Friday so the ladies can forgo the golf garb for more festive attire. A trophy is awarded to the most improved player, won by Janet Carr in 2015. Summer potlucks are occasionally held after the game, most recently at Jeanne Mills’ home, near the 12th green. Non-active and associate members are always welcome. For membership information call Karen Perkins at (949)492-4088. Spring has sprung, June gloom is behind us and it’s time for some summer fun on the golf course. For many local golfers that would be the San Clemente Municipal Golf Course, donated by the City’s founder, Ole Hanson, and ably maintained by club pro Dave Cook and staff. Members of the San Clemente Women’s Golf Club (SCWGC) have been regular patrons since the club’s inception in 1949, meeting weekly on Tuesday mornings for a friendly round of golf and social time with friends. 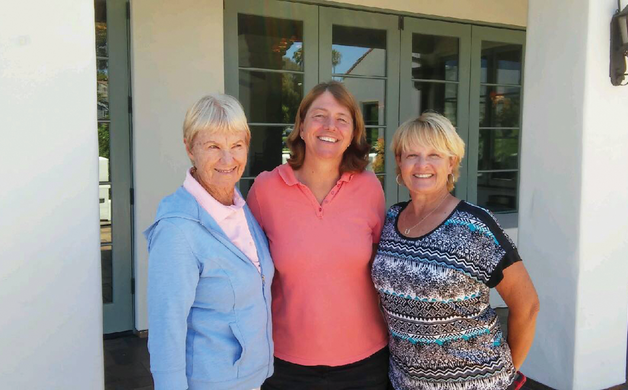 San Clemente Women's Golf Club Championship; in center, Champion Lori Van Hove; left Flight B (2nd place) Dianne Burdick; right Flight C (3rd place) Veronica Knippler. Photo by Marianne McAuley. Dawn Day, this year’s president, said she has found the club “a wonderful place to socialize, make new friends and enjoy and improve your golf game.” Her objective for the year is to increase membership and provide an enjoyable and friendly environment for women of all ability levels. Dawn has been a member “for a wonderful 10 years.” Membership, she said, offers newcomers an opportunity to enjoy golf and make friends in comfortable, welcoming surroundings. Tournament check-in is 7am, with a shotgun start at 8:30am. Format: two best balls of the foursome. There will be equal gross and net prizes in all flights and great raffle prizes. The $85 fee includes green fees and cart, continental breakfast, range balls, lunch and awards. For more information call Vi at (949)412-2966 or go to jovimc@outlook.com. The ladies frequently also attend the Far Away from Home tournament, this year held in Santa Ana Pueblo, NM. Seasonal and holiday luncheons and the annual Spring Fling are fun-filled events that give the ladies a chance to trade their golf duds for something fancy. The club’s membership in the Women’s Public Link Golf Association (WPLGA) gives the ladies access to its monthly competitions, held at selected courses throughout the area – another interesting adventure. For more information visit www.sanclementewomensgc.com. Membership applications are available in the clubhouse pro shop or call Mandy Hamilton at (503) 577-5799. 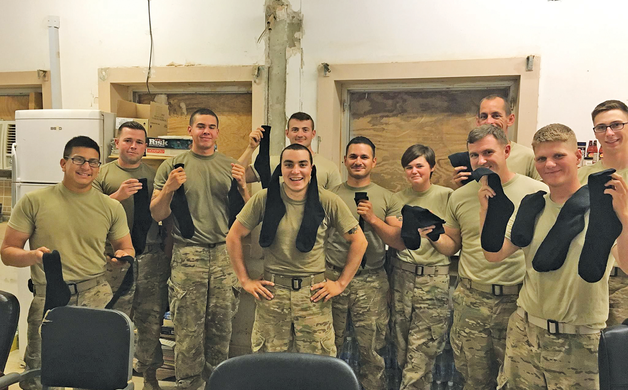 Marines serving in the Middle East love getting new socks. Since May 2011, when Socks for Heroes began, the Hogans have sent food, hygiene gear, other necessities and 417,000 pairs of socks to the troops! That’s over 39 1/2 tons of socks. And the need continues. Gone are the major bases in Afghanistan and Iraq, and the logistic chains that supported them. Basic needs have fallen more and more on service members and their families, the Hogans reported. You can help our military while having a wonderful day on the beautiful Bella Colina course, a Gary Player signature design that has proved challenging yet fun-filled for amateur and professional alike. Rolling hills, sculptured fairways, glimmering lakes and abundant wildflowers make the play something for the senses as well as for the sport. Check-in is 11am. After lunch a shot-gun start will get the 18-hole scramble going. After play, participants and guests will visit the beautiful clubhouse where they will receive a gift bag, enjoy a well-planned silent auction, a delicious dinner, tournament awards and an entertaining. Cost for foursomes is $750, individuals are $200. Both are partly tax deductible. For more information contact the Hogans at (949) 357-5555, email info@scmcsg.org or go online scmcsg.org/events/socks-for-heroes. While the San Clemente Republican Women’s Club has spent the first half of the year learning more about our country, our state and local issues and how to ameliorate some of the problems the nation is facing, they have set aside time for other interests as well. The group’s monthly meetings this year have hosted interesting and informative speakers like: Brenda Wills, founder of I-5 Freedom Network which mobilizes organizations to combat human trafficking, and Dr. Nikan Khatibi, a physician/policy advisor and escapee from Iran, presenting his research and perspective on the Iran Nuclear Deal. Their social gatherings have included Operation Baby Shower held at Camp Pendleton’s Deluv Community, the annual May fashion show and prettiest hat contest benefiting their scholarship program, and a barbecue held on July 24 to raise monies for the 2017 scholarship fund. Scholarships awarded by the club go to local high school seniors who will be attending accredited institutions of higher learning. 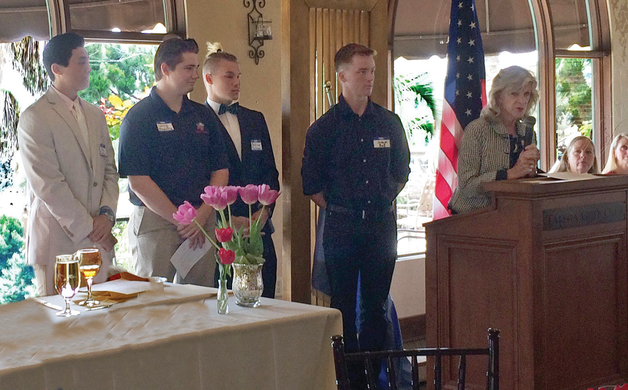 At this year’s June meeting scholarships were awarded to four outstanding young men: Joseph Bell, Andrew Frohner, and Lance Woodstra from San Clemente High School and Sten Kajitani from Capistrano Valley Christian School. President Phyllis Nielsen introduced Scholarship Chairman Mary Beth Ward and her assistant Chalone Warman for the presentation. For more information about the San Clemente Republican Women’s Club visit scarwf.org or call Phyllis Nielsen at (949)218-1445. 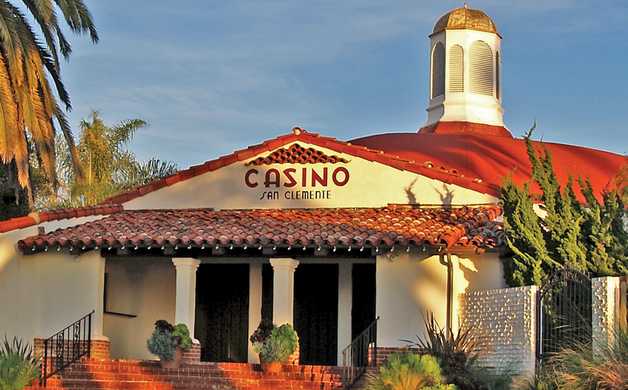 Since its completion in 1937, Casino San Clemente has been one of the city’s most attractive structures. It opened with fanfare and music, luring Los Angeles socialites and Hollywood celebrities to come and dance the night away in the Spanish village by the sea. During WWII the Coast Guard used it as a lookout station. Then in 1945 music, dancing, fine food and cocktail service returned to North Beach. Known as Sebastian’s West Dinner Theater in the ‘70s, it showcased Broadway shows with famous actors of the past like Virginia Mayo, Cesar Romero, Judy Garland, Dorothy Lamour and Mickey Rooney. Becoming the Southhampton Dinner Theater in 1980, it continued with live theater, but also opened its doors for special events and meetings. The Junior Woman’s Club held its annual Miss San Clemente Contest there, crowning the last pageant winner, Kimberly Ray, in 1989. Efforts to redevelop the property for retail or condominiums kept the doors closed in the 2000s until Linda and Shaheen Sadeghi rescued it in 2010. The reopening of The Casino San Clemente resurrected the beautiful building and surrounding grounds, offering a variety of areas as diverse as the Grand Ballroom for parties up to 300 guests, and the intimate Patio of the Stars available for civic functions, private parties and corporate events. And with the introduction of The Casino Summer Nights Jazz Series this year the events have now come full circle, offering great music, dancing and - for the over 21s - cash snack and cocktail service. The series opened July 11 with Orange County jazz vocalist Elizabeth Lambers, drummer Roman Banda, bassist Jeff Littleton and Steve Cotter on guitar. Linda called it an amazing night, with enthusiastic guests already making reservations for next time, vowing to bring friends.